Could this be a rumor that +Kobe Bryant may be quitting basketball? 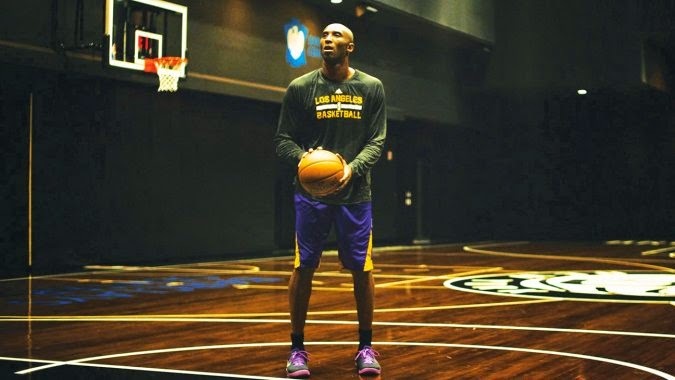 The L.A. Lakers’ Kobe Bryant has been contemplating life after basketball since he was 22. Now that he’s 36, out due to injury and close to retirement, he says he’ll play one more season and finish his two-year contract, which will net him $25 million. But his recent experience as the subject and executive producer of the intimate doc Kobe Bryant’s Muse — produced by Gotham Chopra (Deepak‘s son) and airing Feb. 28 on Showtime — has opened up the possibility of a career behind the lens. “There are so many other stories to be told,” he says, adding that he’d like to profile Phil Jackson and Apple designer Jonathan Ive. You were very candid about the dark periods in your life. Was that difficult? BRYANT It was very difficult. But there’s beauty in that process. You were arrested in 2003 on sexual assault charges, but the case was dropped. How difficult was that to revisit? BRYANT Those were dark days for all of us. We all kind of dreaded that day. Gotham, what were your conversations with Kobe like before you interviewed him? CHOPRA We didn’t talk beforehand because we didn’t want it to feel scripted. It had to feel raw and honest. It was not easy for him. It was not easy for us because you feel like you’re prying into someone’s most personal stuff. But his willingness to go there just made it feel like, now we’re doing something special. BRYANT Probably during my second year [in the NBA]. It takes more time to keep those relationships going. I was just really obsessive about becoming one of the all-time greats. I just loved playing the game so much that everything took a back seat. But I had to make a choice. Once I made that decision, the game became everything to me. BRYANT It depends on what day you ask me. Certain days, when things are going really well, I feel like I have everything. But on days where things are not as good, I question that. Some of your NBA peers have dabbled in acting. Do you have any interest in a career in front of the camera? BRYANT No, I don’t enjoy being in films. It makes me uncomfortable. You went to the NBA directly from high school. What was it like to be thrust into this grown-up world and suddenly making a very grown-up salary? BRYANT It’s really hard, especially for a 17-year-old. You’re having all this money thrown at you, all this attention thrown at you. And there are a lot of leeches. It teaches you a lot about focus. What are you focused on? What are you trying to accomplish? All right, let’s weed out everything else that gets in the way of that. But at 20 years old, I was dealing with a lot. It was crazy. You have never worked with Gotham before, but I understand you had a mutual friend. BRYANT Yeah. He knew Michael [Jackson] very well. And Michael is one of my mentors. When I was 18, he introduced me to his muses. I had never seen a Fred Astaire film. You watched Fred Astaire movies with him? BRYANT Yeah, I wanted to know how he sold 50 million albums, so he walked me through how he prepares, how he trains, how he writes, how he studies. What was the most important lesson you learned from Michael Jackson? BRYANT That everything is connected. Whether you’re a writer, an actor, a singer, a composer or an athlete, the common thread is there. Everything around us is an opportunity to be inspired.